Background: As we aim to embark on a world free of preventable deaths in maternal health, the importance of regulating fertility claims more attention. In India, a country with low resources, this approach is crucial in facing the challenge amid population burst. Chasing the same aim, the country is yet to register targeted total fertility rate of 2.1 at some of its pockets. Aim: This study, analyzing data from District-Level Household Survey 4, tried to assess the association between high birth order (HBO, defined as birth order three or more among women aged between 15 and 49 years) and major sociodemographic factors in South India. Materials and Methods: District was the unit for analysis. From South India, 98 districts were considered. Correlation coefficient was determined to know the association between HBO and six variables: marriage <18 years, married illiterate women, use of modern contraceptives, pregnant women who had three or more antenatal care visits, consumption of 100 or more iron tablets/syrup equivalent, and institutional delivery (ID). Scatter plot was used to show the effect of demographic variables on HBO. Results: Proportion of marriage <18 years (r = 0.671) and proportion of illiterate married women (r = 0.400) were two the factors positively associated with HBO, whereas use of modern contraceptives, consumption of 100 or more iron tablets/syrup equivalent, and percentage of ID had a significant negative association. Conclusion: As evident, HBO is not only related to illiteracy and use of contraceptives but also related with consumption of iron folic acids, age at marriage, and ID. For effective control of population burden, the target for policymakers should be on education, antenatal services, and ID. So far, India has experienced high variation in fertility behavior across its population. Regional variations always play a key role in determining pattern of fertility. Chasing TFR of 2.1 as the replacement level, the performances of different states of the country have never been uniform. For reducing fertility, the government has increased minimum age for marriage through legislation. The strategy worked including societies where the prevalence of contraceptive use was low. As of now, 24 states and union territories have already achieved the target, and rests are making effort to level with their counterparts. Different factors, including illiteracy, low age for marriage, and low female autonomy, have been implicated for high fertility.,, Social security is another reason cited by authors as a driving force for the same. Other factors such as urbanization, social barriers, unwanted pregnancies, and future workforce, along with productivity, are also linked to level of fertility at micro- and macro-level analysis. However, no such study has tried ever to find the associations of these factors in a larger scale. In this background, an ecological study was undertaken to assess the associations of higher fertility and major sociodemographic factors. District was the unit for analysis. Data were retrieved from publicly accessible domain. Proportion of high birth order (HBO, defined as birth order three or more among women aged between 15 and 49 years) was kept as the dependent variable (DV). Six factors, available from District-Level Household Survey (DLHS) 4, were considered for possible association with the DV. Data were collected from women between 15 and 49 years of age. 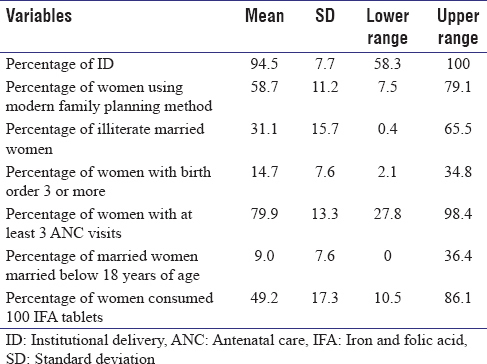 Among independent variables, the percentage of women married <18 years, currently married women who are illiterate, women using modern contraceptives, pregnant women who had three or more antenatal care (ANC) visits, pregnant women who consumed 100 or more iron tablets/syrup equivalent, and institutional delivery (ID) for the districts was taken into account. After thorough literature review, these factors were considered for inclusion in our study. Pearson's correlation coefficient was used to measure association between HBO and different demographic variables and health-seeking behavior. Scatter plot was used to show the relationship between HBO and demographic factors. A total of 98 districts belonging to five South Indian states, viz., Kerala, Karnataka, Tamil Nadu, Telangana, and Andhra Pradesh, were examined. Data for all states were not available at the time of study. Iduki was excluded from the analysis as data on HBO and other factors were not available from DLHS 4. The cross-sectional survey, DLHS, collected data on most recent births to ever married women (which took place after January 1, 2008) from a chosen sample from every district of the country. SPSS for Windows software (Version 19.0; SPSS Inc., Chicago, IL, USA) was used. The summary statistics for HBO and different demographic and health-seeking factors are given in [Table 1]. The proportion of women with HBO ranges from 2.1% to 34.8%. Most of the districts (10 out of 11) with HBO >25% are located in Karnataka. The mean use of modern contraceptive was 58.7%, ranging 7.5%–79.1%. In Andhra Pradesh, most of the districts (seven out of 13) recorded >70% use of modern contraceptives. 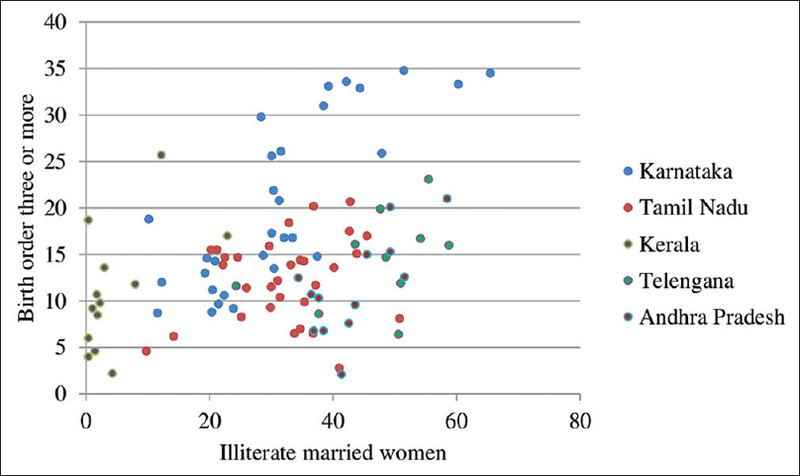 The proportion of illiterate married women varied between 0.4% and 65.5%, with mean of 31.1%. In Kerala, unlike other states, no district has scored >25% illiteracy among married women. The percentage of women married before 18 years was varying from 0% to 36.4%. In Tamil Nadu and Kerala, almost all districts recorded <10% women married <18 years. The average coverage for three or more ANCs was 79.9%, ranging from 27.8% to 98.4%. Half of the districts scoring >90% three or more ANC coverage are from Karnataka. Overall, 14 districts recorded >70% consumption of 100 or more iron and folic acid (IFA) iron tablets/syrup equivalent and none of them was from Tamil Nadu, Andhra Pradesh, and Telangana. Such consumption ranged from 10.5% to 86.1%. As much as 13 districts recorded 100% ID – 10 of them are in Kerala. The proportion of HBO was positively and significantly correlated with proportions of marriage <18 years (r = 0.671, P = 0.000) and illiterate married women (r = 0.400, P < 0.001) [Figure 1] and [Figure 2]. 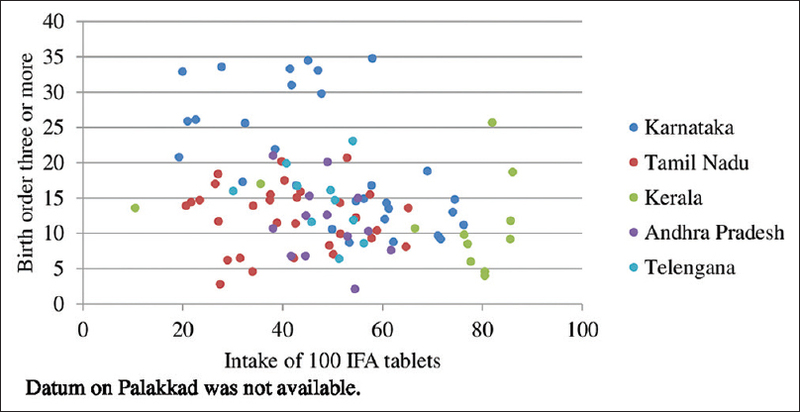 A negative but statistically significant rate was found with rates of consumption of 100 or more iron tablets/syrup equivalent (r = −0.221, P = 0.005) and ID (r = −0.584, P < 0.001) [Figure 3] and [Figure 4]. With three or more ANC visits, proportion of HBO was related negatively, but it was not statistically significant (r = – 0.041, P = 0.693). Similarly, a negative relation was there between use of modern family planning method and proportion of HBO, but it was not statistically significant (r = −0.181, P = 0.076). Higher fertility raises the chance of India to claim the seat of most populous country in future. From this point of view, the present article tries to pick up demographic factors associated with HBO. In the absence of comprehensive data on associations of fertility in a large scale, this paper puts forward sincere effort to find out the same. Overall, the analysis shows variations among geographical areas. While Kerala outperformed others in literacy and ID, AP documented better utilization of modern contraceptives. Karnataka needs to analyze individual districts recording worse HBO, in spite of good ANC coverage. Tamil Nadu and Kerala showed better performance as far as age of marriage is concerned. Education not only boosts autonomy for taking decision on fertility, particularly in gender-stratified society of South Asia, but also enables understand health messages broadcasted by media., As noticed by previous researchers, fertility decline is a feature pertaining to better-educated localities., The present analysis also presented the same, depicting districts with lesser literacy having high proportion of HBO. Education creates perception that contraception is affordable. Better-educated women are also more aware of contraception methods and thus less likely to go for HBO. Similar to illiteracy, early marriage, a societal curse, paves way for early pregnancy due to social customs and higher fertility and ends in longer period of fecundability. It was observed that intake of 100 IFA, ID, or completing three ANC visits – all influence HBO negatively. Although literature is silent about their effect on high fertility, the finding must be interpreted in the light of the fact that all these three factors express health-seeking behavior. With their close relation with literacy and autonomy, all of them may be playing some interrelated role behind determining fertility attitude. Use of modern contraceptive offers better contraception than conventional ones. It also reflects concern of couple about family planning. It has catalyzed reduction of fertility rate in developing world. Like previous evidence, it is also clear from present analysis that contraceptive use is a strong predictor of fertility. The study was limited to five states of South India. Hence, the findings may not be generalized for the whole country, considering its variety of context in different parts. Being an ecological one, the study lacks temporal relationship between variables. Hence, causal relation cannot be drawn from the analysis. Second, issues such as age of sexual debut, duration of marriage, and socioeconomic status were not captured in the survey, which could be important in determining fertility. Still, most cross-sectional studies are limited to certain regions, and large-scale data such as NFHS, DLHS, and CES are limited to simple analysis. From that point of view, this study, in spite of all its limitations, tries to find a picture applicable to a wider part of the country. Fact, there are variations among different districts in culture, terrain, and human behavior, but the study is expected to reflect a regional trend, thus pointing toward the associations of higher birth order at macrolevel. On the other hand, lack of macro-level analysis for HBO and its associations with the latest available data is one of the strengths of this study. Consequently, the results and interpretations presented in this article can provide support to the control of population boom in the country. Considering the fact that in a resource-poor setting, higher fertility would definitely precipitate into economic challenge for the family, focus should be given on education, antenatal services, and ID. There is a need to create collaboration between education and social custom to address complexity of HBO. Further research is warranted to explore factors associated with fertility and newer avenues to address them. World Health Organization, United Nations Children's Fund, United Nations Population Fund, the World Bank. Trends in Maternal Mortality: 1990 to 2013. Estimates by World Health Organization, United Nations Children's Fund, United Nations Population Fund, The World Bank and the United Nations Population Division. Geneva: World Health Organization; 2014. Available from: http://www.apps.who.int/iris/bitstream/10665/112682/2/9789241507226_eng.pdf?ua=1. [Last accessed on 2015 Oct 11]. International Institute for Population Sciences and Macro International. National Family Health Survey (NFHS - 3), 2005-06: India. Vol. 1. Mumbai: International Institute for Population Sciences and Macro International; 2007. 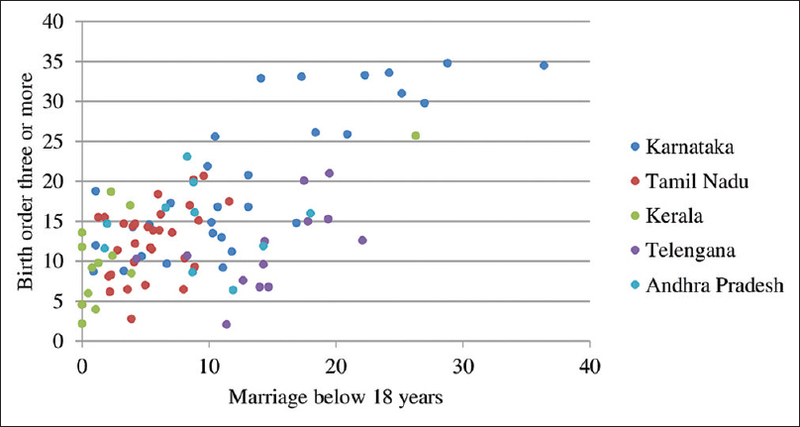 Patterns of First Marriage: Timing and Prevalence. Department of International Economic and Social Affairs. 111. New York, United Nations; 1990. Nakkeeran N. Women's work, status and fertility land, caste and gender in a South Indian village. Econ Polit Wkly 2003;38:3931-9. Chandrasekhar S, Jayaraman A. District Level Analysis of the Total Fertility Rate Using Indian Census Data. Available from: http://www.paa2004.princeton.edu/papers/41578. [Last accessed on 2015 May 18]. Joseph C. Determinants of Fertility Differentials among the Religious Groups in Kerala. Available from: http://www.shodhganga.inflibnet.ac.in/handle/10603/7084. [Last accessed on 2015 May 18]. Casterline JB. Determinants and Consequences of High Fertility: A Synopsis of the Evidence – Portfolio Review. Washington, DC: World Bank; 2010.
International Institute for Population Sciences, India and Ministry of Health and Family Welfare. District Level Household Survey (DLHS-4). India; 2012-13. Available from: https://www.nrhm-mis.nic.in/SitePages/DLHS-4.aspx. [Last accessed on 2015 May 18]. Levine RA, Levine SE, Richman A, Uribe FM, Correa CS, Miller PM. Women's schooling and child care in the demographic transition: A Mexican case study. Popul Dev Rev 1991;17:459-96. Cleland J. Education and Future Fertility Trends, with Special Reference to Mid-transitional Countries. In: UN Department of Economic and Social Affairs Population Division. Completing the Fertility Transition. Available from: http://www.un.org/esa/population/publications/completingfertility/completingfertility.htm. [Last accessed on 2015 Sep 27]. Chakrabarty M, Guilmoto CZ. An analysis of the determinants of fertility behaviour in South India at the village level. In: Guilmoto CZ, Rajan SI, editors. Fertility Transition in South India. New Delhi: Sage; 2005. p. 324-56. Ndahindwa V, Kamanzi C, Semakula M, Abalikumwe F, Hedt-Gauthier B, Thomson DR, et al. Determinants of fertility in Rwanda in the context of a fertility transition: A secondary analysis of the 2010 demographic and health survey. Reprod Health 2014;11:87. Basu AM. Why does education lead to lower fertility? A critical review of some of the possibilities. World Dev 2002;30:1779-90. Gillespie D, Ahmed S, Tsui A, Radloff S. Unwanted fertility among the poor: An inequity? Bull World Health Organ 2007;85:100-7. Kodzi IA, Johnson DR, Casterline JB. Examining the predictive value of fertility preferences among Ghanaian women. Demogr Res 2010;22:965-84.